The day that NASCAR Hall of Fame voters gather to cast their ballots is excruciating for the nominees and their families. They spend most of the day in a tug of war between hope and anxiety. They yearn for the affirmation that comes if they or their loved ones get elected. They fear the hollow depths of rejection if they don’t. When voting day dawned this year, the candidacy of Davey Allison was in the spotlight. It was his second year on the ballot, and it was anybody’s guess whether he would make it this time. 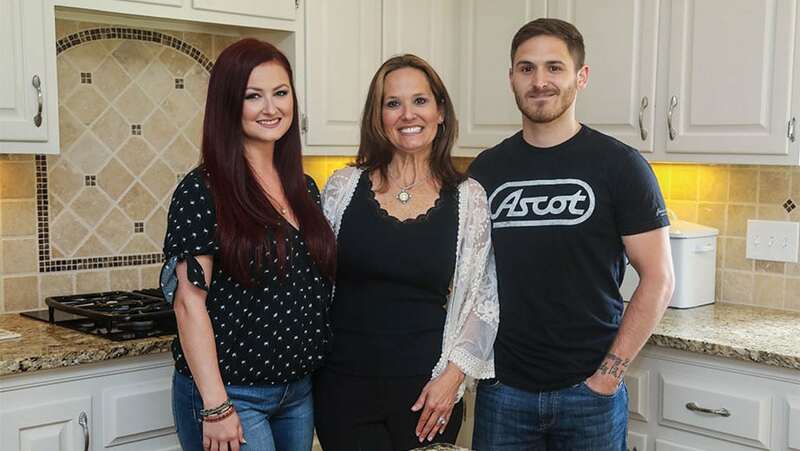 Davey’s loved ones — including his widow Liz, daughter Krista, son Robbie, sister Bonnie and father Bobby — wore anxiety like a second layer of skin. They had gotten their hopes up last year only to be disappointed. They didn’t want to experience that again. The vote and the announcement are done on the same day in Charlotte, North Carolina. Liz and Robbie stayed in Nashville, Tennessee, where they live and work; a six-hour drive to Charlotte on a weekday was tough to pull off regardless, even more so without knowing the outcome of the vote. Krista lives in Dallas, making a trip to Charlotte even more difficult. If the Hall of Fame invites Bobby, a member of the second class, to an event, he goes. He and Bonnie ran errands in Charlotte that morning and wondered what fate awaited them when they arrived at the Hall of Fame for the announcement. On statistics alone, Davey did not have a slam dunk Hall of Fame case. He drove full time for just five seasons and did not win a championship. In 191 starts at the Cup level, he won 19 races. But voters consider more than just raw data. They also consider elusive qualities like legacy, impact and other intangible factors that turn drivers into heroes. If “It Factor” is a criterion — and it surely is, even if it’s immeasurable and undefinable — Davey’s Hall of Fame candidacy gets transformed from borderline to likely. Few drivers in history have combined his skill on the track and appeal to fans. Davey Allison, who died in a helicopter crash 25 years ago this week, combined a famous name with elite driving skills, winking charm and every-man work ethic. Bobby refused to coddle his son and instead insisted he learn the sport from the ground up. From an early age, Davey put in hundreds of hours sweeping the floor in his dad’s Hueytown, Alabama, race shop, organizing the parts and doing other menial tasks not usually associated with racing royalty. That know-the-whole-car approach, mixed with competitive fire and accessibility, endeared Davey to fans. He believed that fans were the gas that powered his career. Without them, it would stall. 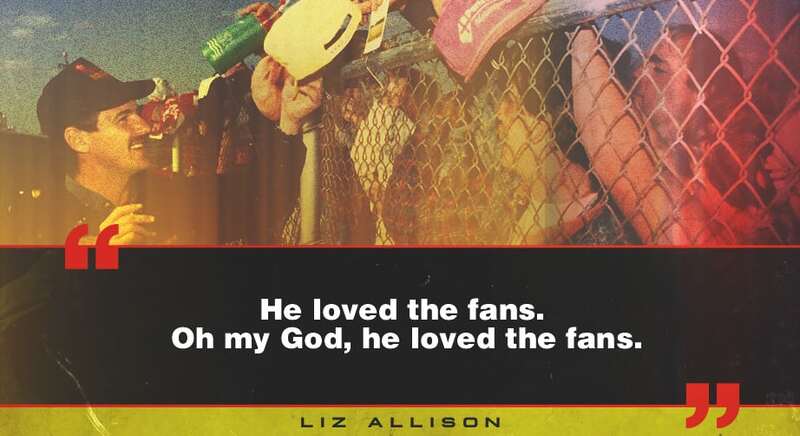 More than most drivers, he sought out fan relationships. He stayed hours after races ended to sign autographs and called race tracks ahead of time to volunteer to help promote upcoming events. Twenty-five years later, Davey remains one of the most fascinating, tragic and popular drivers in NASCAR history. 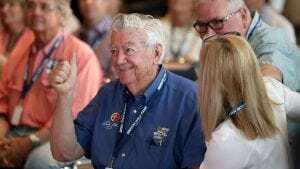 In his short but electrifying career, he was part of some of the most memorable days in NASCAR history, up to and including the day NASCAR Hall of Fame voters decided his fate. If they decided to vote him in, it would not just be because of what he did, but how he did it. For the final lap of the 1988 Daytona 500, CBS’s TV audience saw what Davey saw — his dad’s bumper. Davey, who was running in second, wanted more than anything to get to that bumper and zoom by it. He inched alongside but could not complete the pass. He settled for second to Bobby in perhaps the most famous 1-2 finish in NASCAR’s long history. That one lap of chasing his father offers an apt summary of Davey’s entire racing life. On the race track, the single most important thing to know about Davey is this: He idolized Bobby. He considered his father the best driver of all time and wanted nothing more than to beat him, because if he beat the best, that meant he was pretty good, too. Immediately after the 1988 Daytona 500, Davey experienced two conflicting emotions. He was happy for his dad, and he was deeply disappointed about finishing second to him. It’s tough to say which was more powerful. Davey’s view of that day changed completely a few months later, after Bobby nearly died in a wreck in Pocono. Bobby had broken bones, internal injuries and severe head trauma. Bobby’s racing career was over, and he spent years recovering. Davey’s two most powerful emotions immediately after the 1988 Daytona 500 were happiness for his dad and frustration for having finished second. After his dad’s injuries, Davey’s emotions about the race became pride and gratitude. That was his father’s final win, and he was honored to have finished second to him. It became his most joyful second-place finish and maybe the most joyful second-place finish any driver has ever had. The morning of the 1992 Daytona 500 should have been stressful for Davey. The team had tested repeatedly in an attempt to perfect its primary car, and he wrecked it during practice. His crew thrashed on the backup car for days to get it ready. He must have goosed every one of them he snuck up on. When the race started, Sterling Marlin, Bill Elliott and Ernie Irvan were the class of the field. Davey was good but not as good as they were. Gatorade paid a $10,000 bonus to the leader at the midway point. All three of those cars wrecked trying to win that halfway cash. Davey avoided that crash and took the lead. And then the race got weird. A new and unknown voice suddenly came over the team’s radio. Tommy Allison looked around at the crew, figuring someone was accidentally keying the mike. But that wasn’t it. A “fan” had apparently stolen a radio earlier in the week and was now using it to warn Davey that second-place driver Morgan Shepherd was coming. Somehow that intrusion of his concentration didn’t faze Davey — nothing did, really, not wrecking his primary car, not some random fan talking to his radio, not even being hounded by a Shepherd for the final run of the race. Davey took the lead for the final time on Lap 171 and said he spent 90 percent of each lap from then on with his eyes on his mirror, trying to figure out where Shepherd might go next. Meanwhile, Liz watched the race on television in their motorhome in the infield. As the race wound down, anxiety and superstition unnerved her. She put their kids, Krista and Robbie, in a double stroller and went for a walk around the infield. “I didn’t want to be around anybody, I didn’t want to talk about it, I didn’t want anything to jinx it,” she says. Every few minutes she stole a look at the scoring pylon, which called to her like runway lights call a plane home. Look after look, lap after lap, it said the same thing: Davey was leading. Shepherd was in second. Finally, it was over. Davey first, Shepherd second. Liz could breathe again. In Victory Lane all the people Davey was closest to were there to celebrate with him — Liz, Bobby, his mother Judy Allison, Krista, Robbie, Tommy and crew chief Larry McReynolds. It was like one of those moments where you felt like life is good. After the race, Bobby Allison — almost four years removed from his near fatal wreck at Pocono — joined his son in the press box. He beamed with pride as he sat next to a man he called one of the best drivers in the sport. July 12, 1993, was a Monday, the day after the first-ever Cup race at Loudon, New Hampshire, which was the 191st and final of Davey’s career. He had a strong car, and if a late-race pit stop had gone better or if cautions had fallen differently, he could have won the race. Instead, he led 38 laps and finished third. He flew home that night with McReynolds, who was one of his closest friends, and other members of the team. He drank a beer. He teased McReynolds. The next morning, Davey and Liz discussed the day ahead. He asked her to make country-style venison, his favorite meal, for dinner. Liz said she had a meeting to attend in Anniston, Alabama. 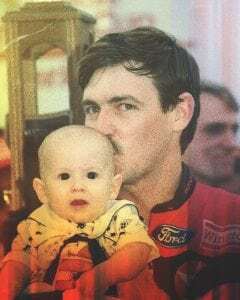 Davey said he had initially hoped to fly his helicopter to Talladega Superspeedway because David Bonnett, the son of his friend Neil Bonnett, was going to test there. But he had too much to do at the shop and couldn’t afford to sneak away. Liz encouraged him to skip the test session and stay at the shop, not least because she hated the helicopter and had always hated it. Davey went to Bill’s Farmhouse, a restaurant in Hueytown, for a weekly breakfast in which he and old timers from around town chewed over the previous weekend’s race. Liz drove to Anniston for her meeting. As she drove home, a helicopter flew overhead. “I remember thinking, ‘Oh, that looks like Davey’s helicopter, but he’s not flying,’ ” she said. But Davey had changed his mind. After eating catfish fillet for lunch at The Iceberg Restaurant in Hueytown with Red Farmer, Davey drove to a helicopter pad at Bobby’s house. He and Farmer strapped into his blue and white Hughes 369HS turbojet chopper and took off. After a 50-mile flight, Davey attempted to land in a parking lot near the track’s infield care center. The helicopter was about a foot from touching down, when suddenly it surged up to about 25 feet, spun counter clockwise, rolled and crashed. I’ve known Davey since he was a baby. He’s like my baby. Davey and Farmer were taken to the track’s infield care center. From there, they were flown by helicopter to Birmingham’s Carraway Methodist Medical Center. Once they found out it was, Helton told Lynch to go with Bonnett to the hospital while he stayed behind to manage the scene at the track. Lynch and Bonnett jumped into Lynch’s Chevy Blazer. Lynch told Bonnett, who won 18 races in 362 Cup starts and died seven months later in a crash at Daytona, to drive. Yeah, I lost a race car driver that I’ve worked with, that I’ve enjoyed tons of success with. But I lost my best friend. Liz got home, took off her sandals and ran into the kitchen without closing the front door behind her because she was going to leave again to pick up the kids, Krista, 3, and Robbie, 1. In Charlotte, Robert Yates called McReynolds into his office. Yates looked like he was in shock and told McReynolds that Davey was in trouble. The driver and crew chief were uncommonly close, and McReynolds wondered aloud what Davey had done or said. Davey was a fiery competitor, and he spouted off every now and then. She asked McReynolds if he wanted to go see Davey. He said no. 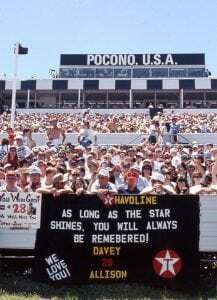 He wanted his final memory of Davey to be of the two of them flying home together from New Hampshire the day before. He wanted to remember Davey drinking a beer and teasing him, not dying on a hospital bed. Davey’s brother, Clifford, had died in a crash at Michigan International Speedway 11 months earlier. Judy Allison was next to Liz in the hospital. “She was on her knees sobbing,” Liz said. The doctor asked Liz if she would consent to Davey becoming an organ donor. She huddled with Tommy Allison to discuss the idea. “If you think he would, then just do it, Liz. He’s gone, but someone else is still here,” Tommy Allison said to Liz. The two decided to donate Davey’s heart, liver and kidneys. They also could have donated his corneas, but Liz, in a decision she now regrets, could not imagine someone else having Davey’s eyes, so she said no to the corneas. Those procedures started immediately. Davey’s heart went to a 54-year-old man, his liver to a 48-year-old woman, his left kidney to a 51-year-old man and his right kidney to a 46-year-old man. One of the kidneys went to California. The rest of the organs were transplanted in Alabama. While the liver recipient is still alive, the men who received Davey’s heart and kidneys have died. Collectively, those three lived 24 years after their transplants. McReynolds says US Airways flew Robert Yates Racing team members from Charlotte to Birmingham for the funeral. The flight was christened No. 28, Davey’s car number. The funeral drew a standing room only crowd of 750 to St. Aloysius Catholic Church in Bessemer, Alabama. Davey was a devout Catholic, and that was his home church. “It took every piece of fire and police apparatus from Hueytown and Bessemer to block off the two-mile route from the church to the Highland Memorial Gardens in Bessemer,” Peter Golenbock wrote in Miracle: Bobby Allison and the Saga of the Alabama Gang. Robert Yates Racing skipped the race that weekend to grieve and figure out what to do next. That was the first Cup race without an Allison since Nov. 2, 1975, a span of more than 18 years. McReynolds considered quitting the sport. But then he thought of a conversation he had with Davey after Clifford died. So that’s what the No. 28 team did. McReynolds and crew returned to the race track two weeks later, at Talladega, with “Our Teammate Forever” painted on the car and Robby Gordon behind the wheel. 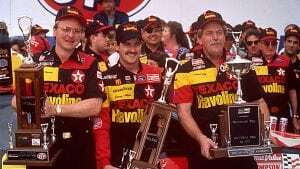 Ernie Irvan became the full-time driver later that year, and he won two races in the No. 28 car that season. NASCAR arranged to have Hal Marchman, a pastor from Daytona Beach who often gave invocations before races, to stand with Liz in case she faltered. 1992 was a tumultuous season for Davey Allison. For weeks, it seemed like he either wrecked or won. Then came the All-Star Race, and he managed to do both, as McReynolds put it. In the first NASCAR race run under the lights, he was injured in a crash as he took the checkered flag in a race known as “One Hot Night.” He was unconscious when safety workers got to his car. He was cut out of it by Jaws of Life and spent two days in the hospital. Twenty-six years later, Eddie Gossage, a Hall of Fame voter who had been Bobby’s PR man and a friend of Davey, thought about that wreck as he pondered whom he would vote for this year. 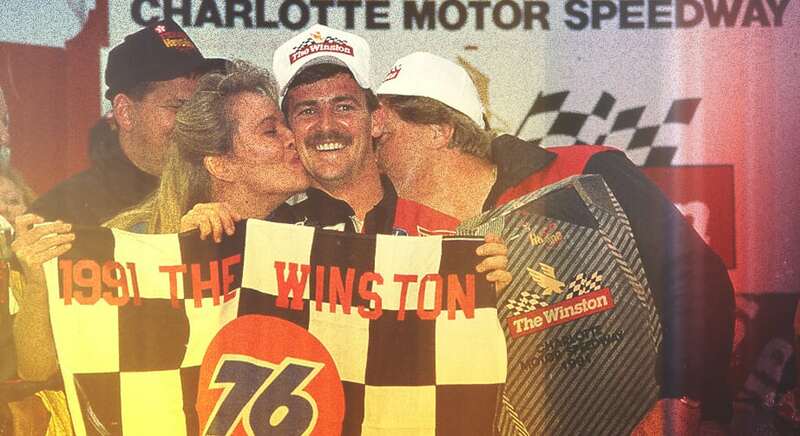 Gossage, Charlotte Motor Speedway’s vice president of public relations at the time, said Davey was supposed to speak at a dinner at the track that week. “During the reception he asked me to take him to my office because he was hurting so badly. He said every organ in his body was bruised from the crash. Everything inside of him bounced around on impact,” Gossage says. Because of stories like those two, Davey’s “It factor” Hall of Fame case was rock-solid, even if his stats were not. But would it be enough? The voters discussed Davey’s candidacy and Alan Kulwicki’s candidacy together, which was fitting because their legacies are intertwined. It was Kulwicki who won the 1992 championship, and he died in a plane crash April 1, 1993, just months before Davey’s passing. Some voters appeared to consider their candidacies as either/or — they would vote for Kulwicki or Davey but not both, and whichever one made it this year, the other would make it the next. Someone spoke up and said there was no reason not to vote for both of them. Votes were cast, the meeting broke up, and the announcement started. NASCAR Chairman & CEO Brian France read off the first three names — Jeff Gordon, Jack Roush and Roger Penske. Sitting next to her dad, Bonnie worried that Kulwicki would get in this year and Davey would have to wait until next year. When France said the next inductee had his life and career “tragically cut short,” Bonnie thought, he’s talking about Kulwicki. Meanwhile, in her home Nashville, Liz Allison dropped to her knees and cried. 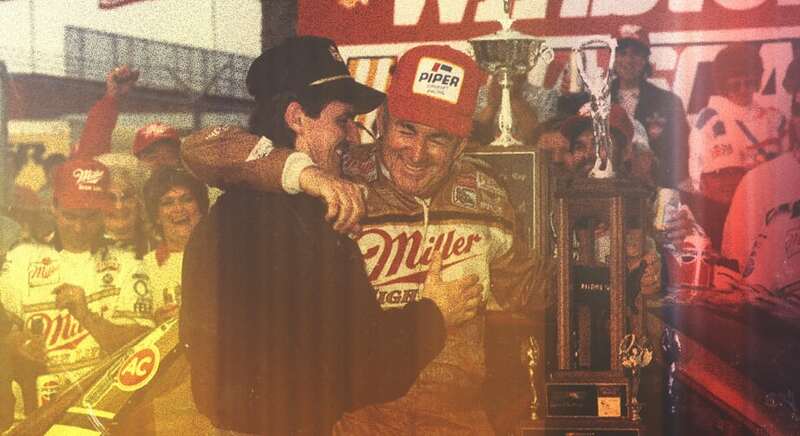 Bobby and Davey are the fourth father and son combination elected to the NASCAR Hall of Fame. They join Ned and Dale Jarrett, Lee and Richard Petty and the two Bill Frances, Sr. and Jr. Afterward, Bonnie and Bobby drove to Bobby’s favorite restaurant — Big Daddy’s in Mooresville, North Carolina, a suburb of Charlotte that is home to many members of the NASCAR community. On the way, they called Liz. She was still crying. For years she feared Davey would be forgotten. His Hall of Fame election guaranteed that he never would be. Bonnie and Bobby walked into the restaurant still high on the events of the previous few hours. They accepted congratulations from patrons as they walked to their table. They sat down and exhaled in relief. And then they drank a toast to Davey. Sources: Sports Illustrated, Los Angeles Times, UPI, Sporting News, Miracle: Bobby Allison and the Saga of the Alabama Gang, race broadcasts accessed via YouTube, interviews with participants.